The district and school calendars have tremendous potential for not only parent engagement but also for community relations and school marketing! Let’s look at a real-life example. Snowflake Unified School District #5 serves the Northeastern Arizona communities of Snowflake and Taylor, and the effective use of their websites has always been impressive. Tohna Rogers is the administrative assistant to Hollis Merrell, superintendent of Snowflake USD, and she is largely responsible for the exceptional online impression made by her district. 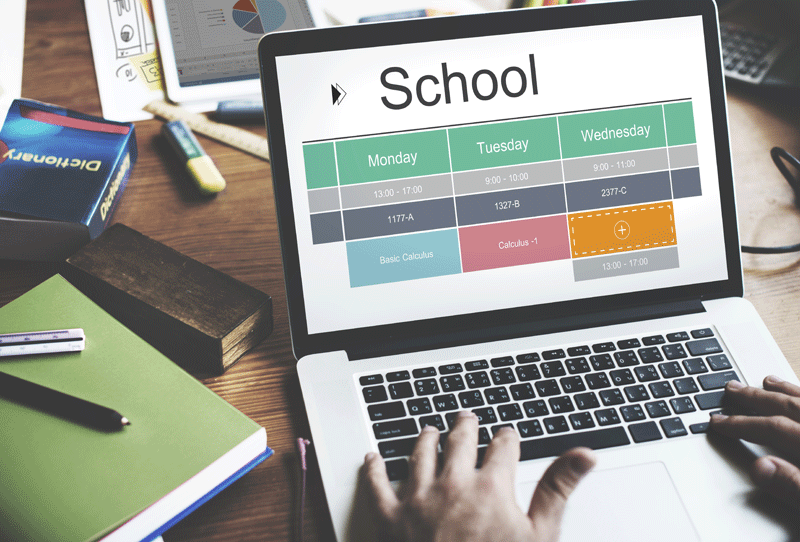 The quality control manager at School Webmasters recently spoke with Tohna to learn her secret for keeping the website and, in particular, the district and school calendars up to date. We love Tohna’s response. It captures, in essence, one of the most important goals of school communication—parent engagement. What do parents need and want to know? The information to answer that questions ought to be readily available on your school websites, and there is no more logical place than on the school calendars. Tip #1: Any district-wide event goes on the district calendar. Any event that specifically relates to the school goes on the school calendars. It seems like a simple rule, but you would be surprised how much confusion this can clear up. Schools don’t need to worry about posting holidays, school closures, professional development days, board of education meetings, etc. because all of that information is on the district calendar. Instead, schools can focus on adding events and activities that showcase the wonderful things happening at school. Tip #4: Know your community and know your parents. Tohna explained that the key to answering her crucial question involves both knowing her parents and her community. To explain, she gave an example of one of the big high school events. Every year in October, the high school puts on a homecoming parade. One might not expect kindergarten parents to care when the high school parade begins, but the parents in her community do want that information. Tohna knows that the roads surrounding the kindergarten pickup location get congested on parade day, and parents will need to adjust their travel time depending on when the parade begins. So, Tohna places the high school parade on the district calendar—it’s not a district event, but it will affect all parents in the district. Because Tohna knows the needs of the parents and the community, she can make their needs her top priority when making school calendar decisions. Bonus: The district calendar can also be a wonderful way to market your schools and encourage good community relations. Tohna applies this additional strategy to her calendar decisions. She uses the district calendar to judiciously highlight individual schools throughout the year. She believes everyone in the district needs to be aware of the excellent activities that take place in the “other” buildings. Using the calendar to promote bigger events and highlight the exceptional activities at select schools is an effective way to build community support and pride! Use this tactic judiciously, and don’t forget to invite the local media to those kinds of events. It’s important to note that parents rarely visit the district website because they are often only interested in news relating to their child’s school—and that’s okay. Many school calendar tools will allow you to display the district items on the individual school pages. For an example, see Snowflake High School’s calendar. It shows both the district events as well as school events. But even if your school calendar tool doesn’t transfer information, don’t feel like you need to duplicate all the events from the district calendar on all the school calendars. Trust that active community members will know to check the district calendar for things like board of education meetings. At School Webmasters, we use interactive calendars on all our websites. The interactive functionality means the website visitor can view the calendar in different formats, sort by the different schools, and have reminders of events sent directly to their Outlook or Gmail calendar or phone. We’ve partnered with Trumba to bring our clients one of the most feature-rich interactive calendars available on the market today. When asked what Trumba feature Tohna finds most useful, she did not hesitate. Mixed-in calendars was her answer. Tohna knows that in her community, many families have students in multiple schools. Those parents can go to the district calendar page and choose all the schools their children attend. They can easily see the activities of their elementary, middle, and high school students on one calendar. But how does her community know to do this? To make sure Snowflake parents are aware of the features of the Trumba calendars, Tohna provides Trumba demonstrations during Parent Night. Parents are not the only ones who use the mixed-in feature–being able to click the mixed-in calendars on and off also makes it easier for staff to plan and attend events throughout the district. Tohna added that community members inside and outside the school count on their Trumba calendars. For example, the community Head Start program staff regularly consults the district and school calendars when planning their schedule and events. Because Snowflake USD uses their calendars as an efficient school communications tool, the community trusts and depends on their district and school calendars. Managing your calendar might seem like a menial task but don’t underestimate its power as a public relations tool. As Snowflake USD demonstrates, your school calendar can engage parents, unify the community, and market your school.